This past weekend Matt Kennedy and I hiked to the top of one of the most treacherous mountains in all of Arkansas, Sugar Loaf Mountain. This Sugar Loaf is not to be confused with the Sugar Loaf Mountain which can be found in the middle of Greers Ferry Lake. It is actually found on ASU’s campus in Heber Springs. The morning was absolutely spectacular with a beautiful sea of fog stretching as far as the eye could see. I captured a few great photographs that would be worth sharing, but I felt this one was appropriate for the season. It’s overlooking a few homes on the Little Red River as seen from Sugar Loaf. I shot it pre-dawn with a cover of fog so it gives the scene a nice cold look. 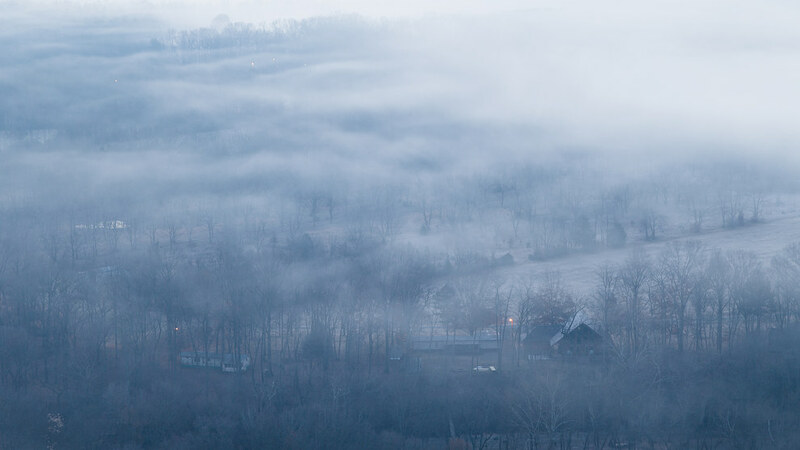 I hope you enjoy it just as much as I did capturing it that cold morning atop Sugar Loaf Mountain.